In the spirit of getting back into this blog, and inspired by this week’s recipe post (garlic mushrooms with baby spinach and cous cous) I present this week’s food picture. This was taken at the cafe at the nursery between the airport and my parent’s place. I really don’t love the idea of nursery/cafes, the concept invokes visions of Bunnings and Kath and Kim meeting in some sort of horrible, stale cake, plastic chair mess. But somehow in the execution they win me over. This place has a lovely atmosphere, with tables under trees and amongst the flowers. They make nice coffee (it’s the Mornington Peninsula, everyone makes nice coffee) and decent food. It’s nice. Pictured above is a bed of rocket and parmesen with garden herb mushrooms in … I can’t remember how the menu made a hollowed out bread roll sound sophisticated and cool. 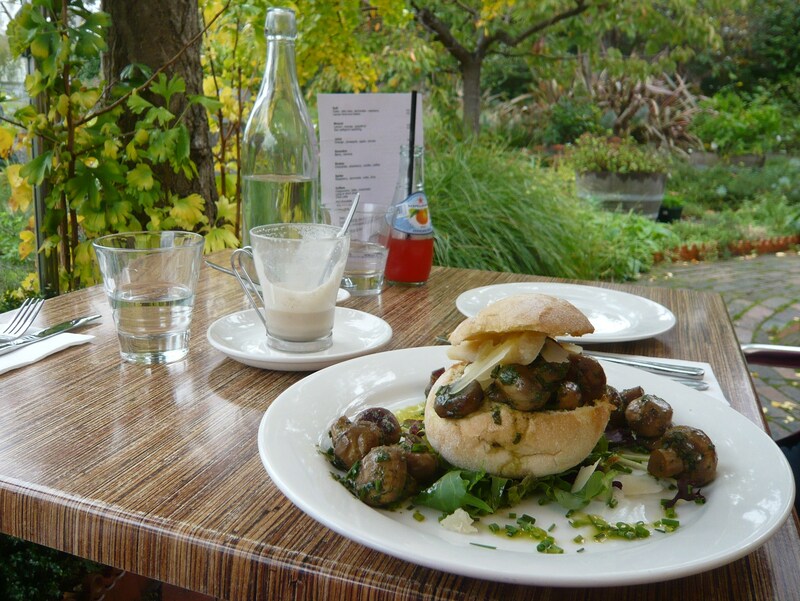 Posted in restaurant reviews and tagged Mid-week Pic, Mornington Peninsula, mushrooms, things other people cook. Bookmark the permalink. I think nurseries and book shops are the two retail types that can pull off classy dining too.